Decision trees are predictive models that have widespread use in operations research and other disciplines to perform decision-making in a logical way. It provides a visual representation of risks, rewards, and value of each decision. It helps to gain a balanced perspective of the pros and cons of each possible course of action and identify the best approach to reach the intended outcome. Download a sample decision tree template here. 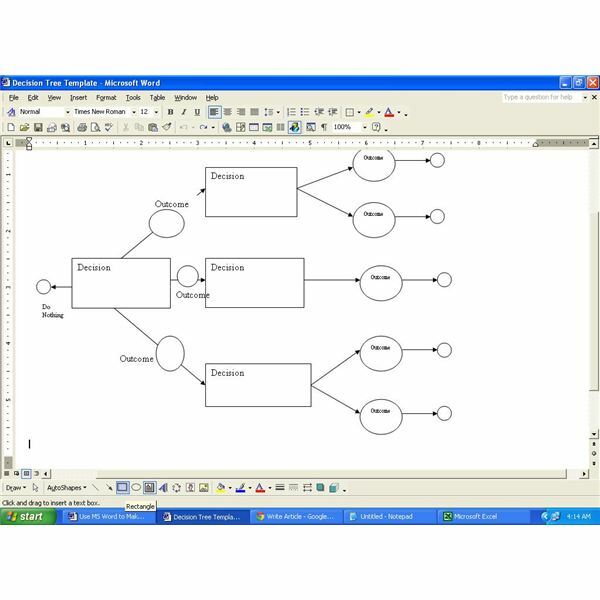 This .doc file contains a basic and generic decision tree created using the available drawing tools within Microsoft Word. The decision tree consists of rectangles, big circles, small circles, and arrows. Each decision, represented by a rectangle can lead to one or more outcomes, represented by big circles. An outcome may require further decisions, leading to further outcomes and so on. A small circle denotes the end of the line, or the path having reached its logical outcome with no further decisions or choices possible. The downloaded decision tree includes only two levels of decisions and outcomes. Expand or contract as needed. Replace the indicators with actual descriptions of the decisions or the outcome. To add new decisions or outcomes, select the square or circle tool as appropriate from the Drawing menu and place it at the appropriate place. Link the same to the previous node by an arrow from the drawing tool. To enter text, place a text box atop the circle or rectangle. To delete a node, click on the rectangle, circle, or arrow, and press delete. A completed decision tree provides a visual overview of the various options available, and help in identifying the best possible path. Assigning numerical values to each line help quantify the path, further facilitating decision-making. One important consideration when drawing a decision tree is to input specific data and values. Providing vague alternatives can lead to faulty decision trees, negating the very purpose of making the effort. The major drawback with using a decision tree is its highly volatile nature. Even a small change in data can make major changes to the structure of the tree, making a template redundant. For this reason, it is a good idea to draw the decision tree using pen and paper, and transfer to MS Word after having finalized the tree. Moreover, large decision trees become unwieldy, and difficult to fit into a single page of MS-Word. Large decision trees also become very complex with many branches and sub branches, making representation in a single sheet very difficult. An alternative approach to using a decision tree template for Word is to rely on the various decision-tree-making software available. Such software-powered trees provide flexibility and ability to insert decisions and outcomes in the middle, much easier than what is possible with MS Word. Decision trees bear close similarity, and combine well with other decision-making tools such as PERT charts and linear distributions. Beasley, J.E. "O-R Notes." Retrieved May 15, 201. Penn State University. Drawing a decision tree to support decision making. Retrieved May 15, 2011.